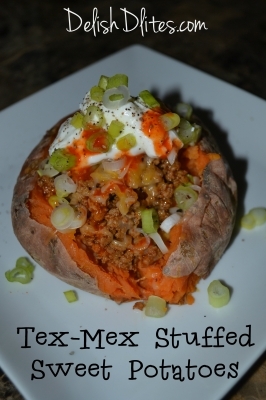 My Tex-Mex stuffed sweet potatoes are spicy, zesty & creamy, and so simple to put together. It's a complete meal, and you can easily make it paleo by eliminating the sour cream and cheese and replacing it with plain Greek yogurt. Preheat the oven to 400F. Poke the sweet potatoes with a fork to create steam vents, then place them onto a baking sheet. Roast the sweet potatoes in an oven for 50-60 minutes, until fork tender. In a medium pan, cook the turkey until the meat is no longer pink. Drain any fat, then season with the packet of taco seasoning as per the package instructions. Set the meat aside. When the potatoes are done, make a slit down the middle of each one and fluff up the sweet potato flesh. 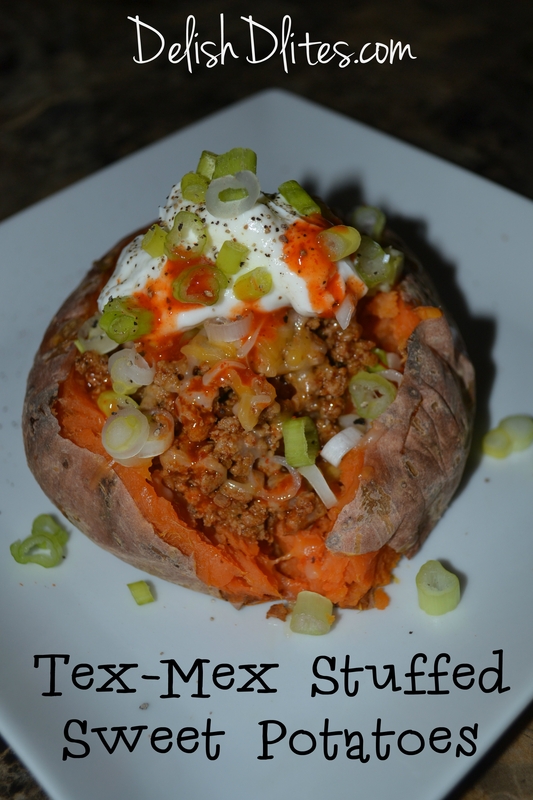 Top with 1/4 cup ground turkey, 1 tablespoon of green onions, 1 tablespoon of cheddar cheese and 1 tablespoon of sour cream or greek yogurt. Drizzle with hot sauce, if desired.